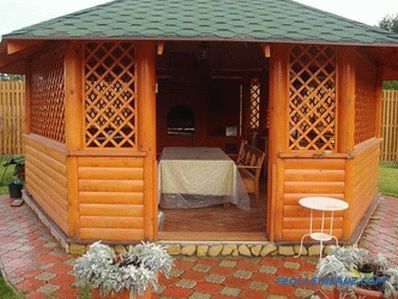 Which of us does not like to relax in nature, enjoying the fresh air, scenic views, pleasant communication with family and friends? 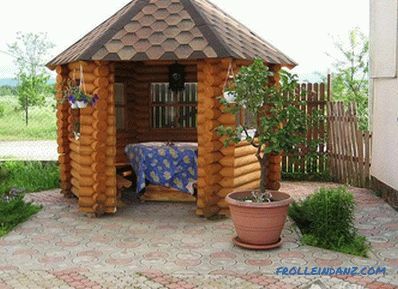 For a comfortable and relaxing holiday in the country can not do without a gazebo. It is not so difficult to perform independently, having free time and necessary material. Where to place is a personal choice, but it’s best to have a shade of trees rather than the scorching sun, and, if possible, near the reservoir. Such a building will be a practical and original solution for the garden plot. 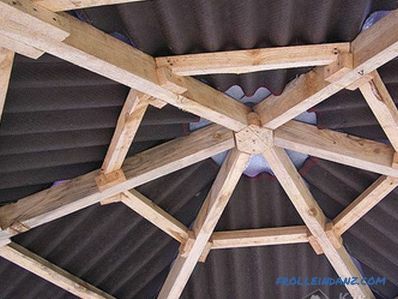 This article will discuss how and from what materials such an arbor can be made. stable and durable thanks to its design. 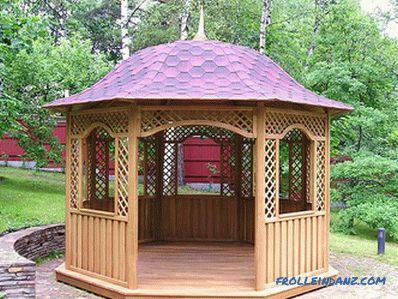 In order to to make a six-sided arbor, you need to decide on the choice of material. 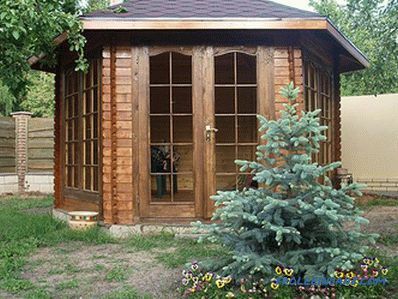 In this case, suitable spruce or pine, because of its properties, this material is quite durable and relatively inexpensive. Before the start of work, it is necessary to make drawings, where the dimensions will be reflected. For example, the height of the structure may be 2.6 m.
When you decide on the dimensions of the future structure, saw boards and bars of the required size on a circular machine and trim them with an electric planer. Then you want to mark the site for construction. 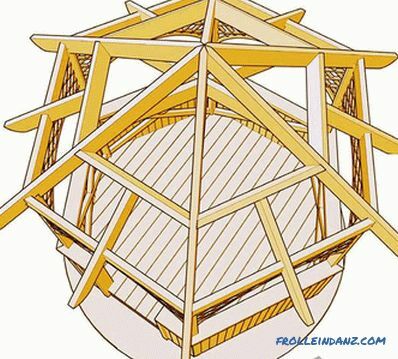 To get the hexagon of the correct form, you need to draw a circle of a given diameter, using two wooden pegs and a rope. On the circle, you must draw six lines equal to the diameter of the circle and at the intersection of the lines apply notches. In the places marked with notches, pits are dug under the foundation with a depth of about 50 cm. A layer of sand about 10 cm thick is poured at the bottom and rammed. As a support for the supporting pillars, you can lay pavement tiles 30 * 30 cm into the pit and lightly smudge them. After installing the support bars, the pit can be filled with sand, followed by tamping and watering. Also in as a basement under the gazebo, you can use concrete blocks. In order to give strength and stability to the wooden structure, at the corners of the markings in the excavated pits with tamped bedding it is necessary to drive one reinforcing bar 1-1.5 m long. The diameter of the reinforcement may be from 10 mm, but in this case it is hard to score, as it will vibrate. To do this, you can put a piece of pipe on the reinforcement and hammer a rod in it. The pipe must be removed, and then in the concrete blocks to drill holes and put them on the valve. 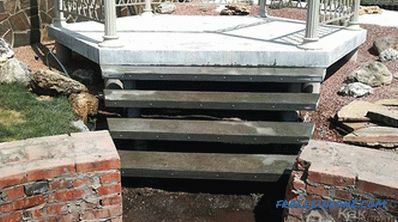 It is necessary to lay a layer of waterproofing on concrete pillars - this can be two layers of simple roofing material. 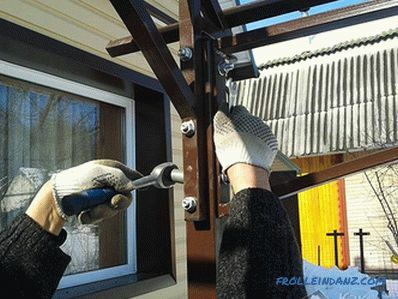 Then, using an electric drill, they drill holes in each wooden beam and put them on the fittings of the well type, and cut them at the intersection of the bars. For strength and alignment, pre-cut for the connection "in half a bar." Then the bars are collected and fastened with nails. For supports suitable bars section of 100 * 100 cm. The next step - the device base. 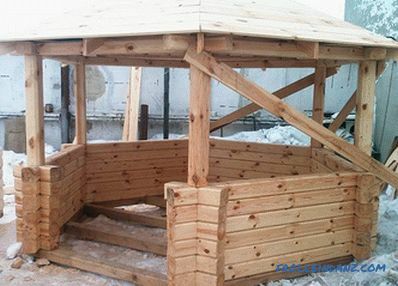 If the gazebo is large, then in the middle you need to make a support pole, which will serve as a support, and then lay the logs, having previously treated them with protective impregnation from the destructive action of moisture. As flooring, widely used are grooved wooden boards, moisture resistant plywood, as well as moisture resistant chipboard and OSB boards. After fixing the flooring, you can put up support pillars, pre-drill holes for the reinforcement, and then put the bars on it. Using a plumb line, you need to check how vertically these poles are installed, and then fix them in this position with temporary jumpers. The crown is made according to the same principle as bottom ring frame. It is laid on the bars and secured with screws. The final stage of construction is the installation of the roof.This happens as follows - the tops of the vertical pillars are connected with bars, leveling them with a hacksaw with the end part at an angle of 60 degrees, and then fixed with self-tapping screws. 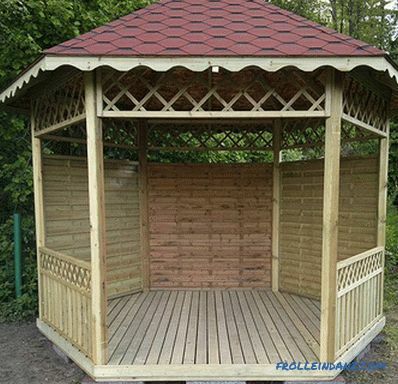 When the frame is fully ready, the gazebo is covered with roofing material. 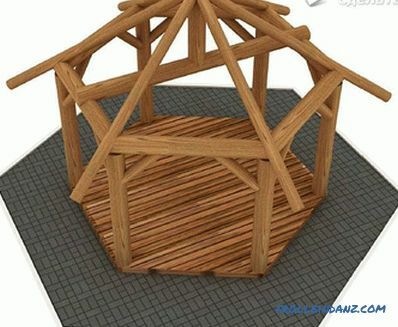 For convenience, the roof is best performed on the ground, and after the finished structure should be installed on the upper ring of the structure. In that case, if the roof is assembled at the top, two boards are mounted on the upper ring, a support column is mounted on them, and then guide bars are placed on it and fixed. Finished sheathing sheathed sheet material or slats. 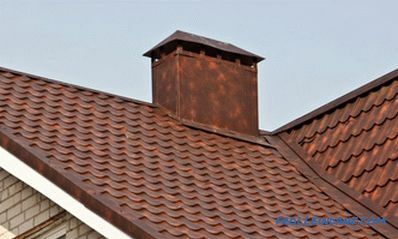 For a roof use a metal tile, a professional flooring or other material. Arbor around the entire perimeter must be protected with handrails 0.9 m high. The railing is made of ordinary boards, and with the help of a special pattern they can be given an unusual shape. Vertical bars can be sheathed with clapboard or decorative grille made of wooden slats. 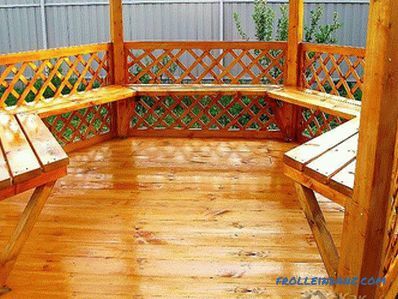 To protect a wooden structure from rotting and to give a beautiful appearance, you need to be sure to varnish it or paint it - the choice is yours. You can equip the path for convenience and make a small porch, fill the internal volume with floor and wall vases with fresh flowers, and arrange with evergreen climbing plants on the outside of the wall. 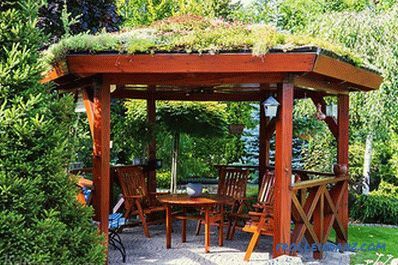 You can build a wooden arbor with the skills of carpentry, and in metal manufacturing you will need knowledge of plumbing and special tools. 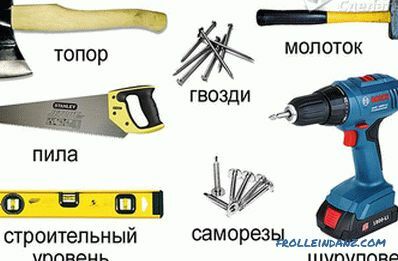 In this case, of course, can not do without welding. 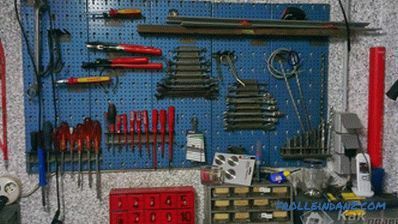 Therefore, it is necessary to skillfully use the welding machine. The advantage of a metal structure is that metal structures are more durable than wood, especially in the underground part of the building. 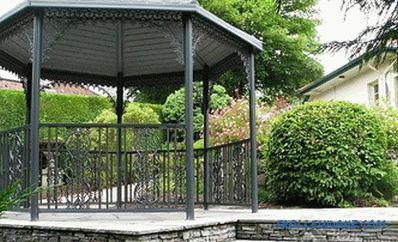 Since not every garden owner can afford to buy a ready-made metal or forged gazebo, it’s worth making the production yourself. First you need to decide where the metal building will be located. 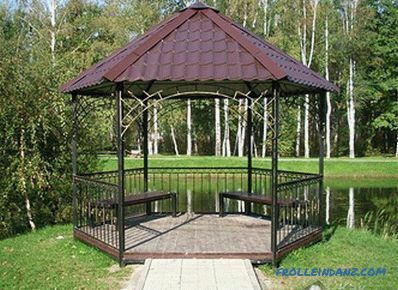 It is better to install it near the pool or pond and where there are beautiful views of the garden area. 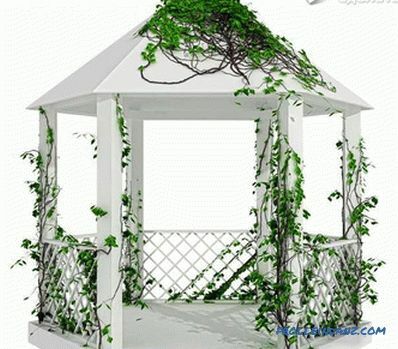 Considering that the look of such an arbor is more pompous, it will look good in a park or garden. The metal frame is sheathed with materials that will protect it from wind and rain and make it possible to install the brazier inside. Compared to wooden, metal structures are distinguished by durability, but without proper anti-corrosion treatment they begin to rust. 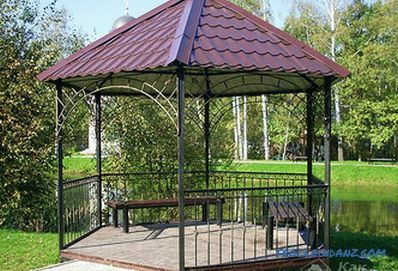 These gazebos are not subject to rotting and fire, but are installed on any foundation or without it at all. Installation of metal structures is relatively simple, and a rigid frame prevents the change of geometric shapes when the ground subsides. Metal arbors are temporary and capital. Temporary arrange for the summer, and cleaned for the winter. The foundation for such structures is not needed. Sometimes hollow pipes are driven into the ground as a foundation, which will serve as the basis for the framework. In winter, the top of the pipes should be closed from falling into the sediments and debris. 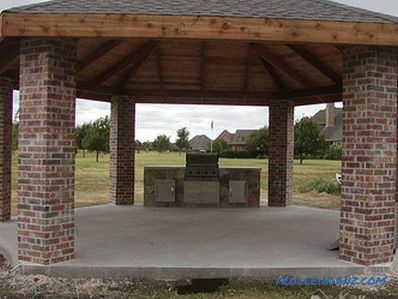 Capital arbors require a solid foundation, which is arranged before construction. The base may be wooden flooring or concrete pavement. It is necessary to impregnate the elements of the base of the tree with an antiseptic, and metal parts to be primed to avoid corrosion. 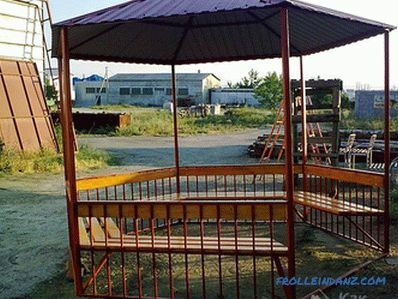 For the installation of metal gazebos need a competent and responsible approach. 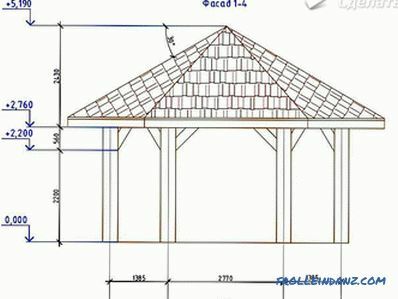 First you need to make a drawing with an indication of the size and calculate the required number of pipes for the frame and supports, the amount of roofing material. Buying building materials you need with a drawing to get everything you need and properly dispose of the funds. At the beginning on the ground where there will be a gazebo, markings are made in the corners. Then you need to dig holes and install pipes in them to connect with the legs of the metal frame. To the part of the pipe that will be concreted, pieces of reinforcement are welded in advance.With the help of a plumb or construction level, the pipe installation is checked vertically, then they are fixed and concreted. Between the pipes make a wooden or concrete floor. 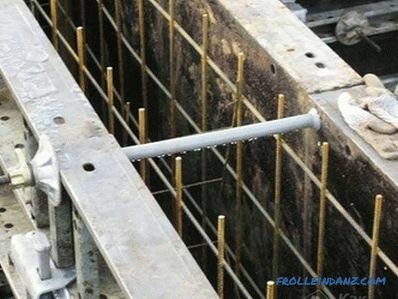 After the pipes are concreted, the main structural supports of the structure are inserted into them and welded to them. Then racks on top are connected with the help of horizontal pipes. So the main frame will be made. 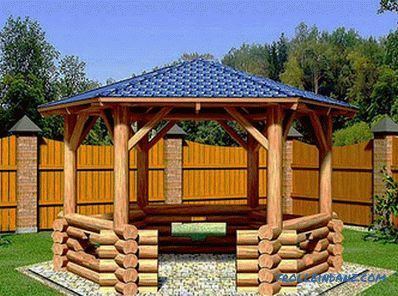 Then you should install additional crossbeams or pillars, the number of which depends on the size of the arbor. 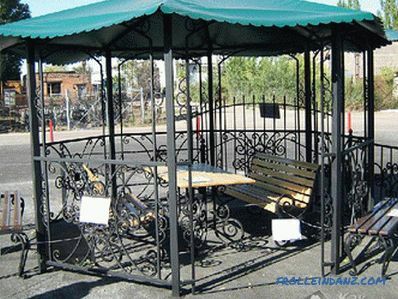 The metal team gazebo can be assembled by welding or bolted with nuts. 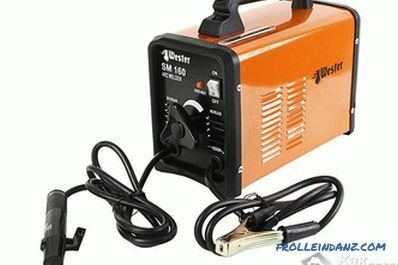 The choice depends on the ability of the owner of the garden area to work with the welding machine, as well as on the financial possibilities to pay for the services of a professional welder. 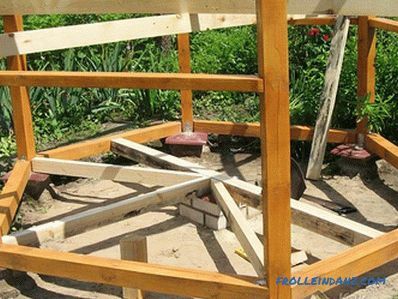 After the frame is assembled, you can begin the installation of the roof of the chosen material. 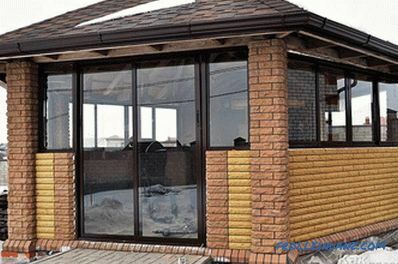 You can assemble the frame with a bolted connection, but the appearance will not be very attractive, and the construction will be less durable. This type of connection is most often used for collapsible structures. 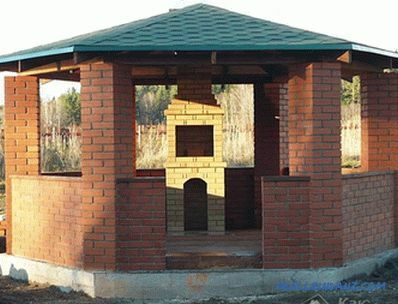 Many people prefer to build of brick, embodying a variety of design solutions for the construction. Brick arbors are very popular today. They may differ in design and style. If this is necessary, provide glazing and heating. 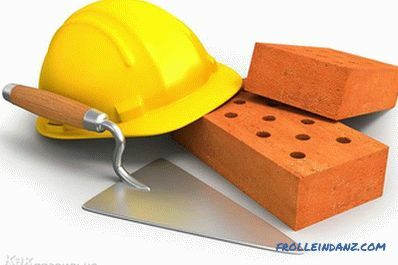 The main advantage of brick buildings is that they are durable, and their maintenance and maintenance is simple. Three types of buildings are most common : open, half-open and closed. 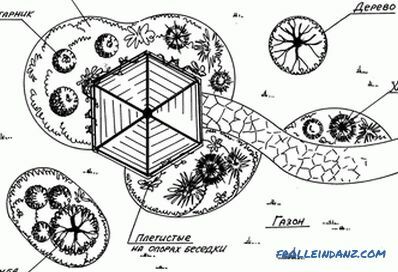 Open - a structure that is designed to rest in it in the warm season. 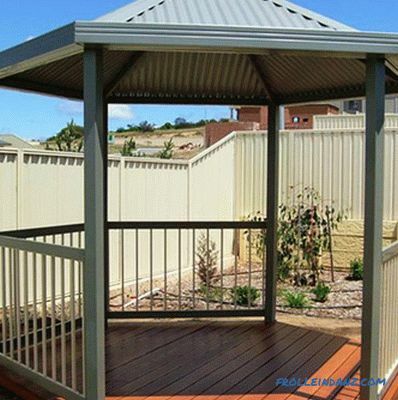 For decorating it, wooden or metal gratings are used, along which climbing plants can be made. 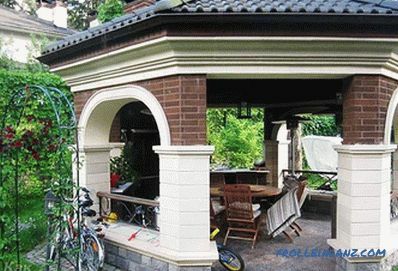 The basis of the semi-open arbor is one or two retaining walls. Inside this structure can be installed brazier. The closed construction is intended for use throughout the year, as it provides for glazing and heating. 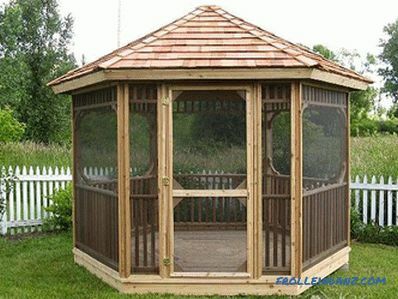 So as the presence of a gazebo on the garden plot is permanent, therefore it requires a reliable and strong foundation. This makes the structure stable and will increase its resistance to wind loads. Before construction begins, it is important to make a choice as to what the structure will be. 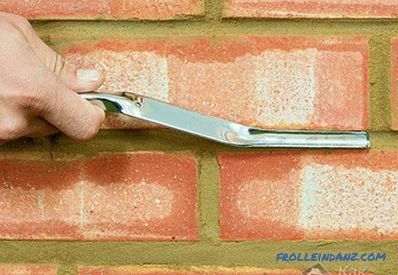 Walls are erected with a thickness of half a brick — this is the most popular option. If the wall is built on a section with a slope, then the foundation under the wall is stepped. 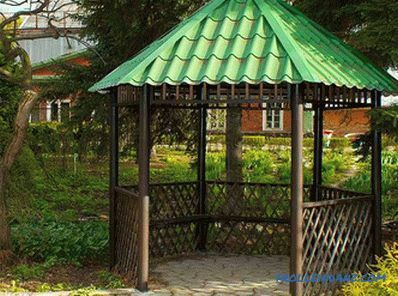 Basically, the arbor is erected from decorative bricks, which today are produced by many species, which eliminates the need for further wall decoration. First of all, the foundation is laid. Moreover, the foundation pit is a certain depth, which depends on the type of soil. 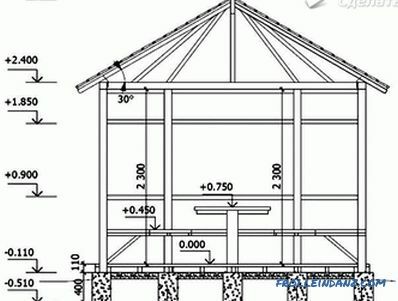 It is necessary to correctly calculate the ratio of the depth and weight of the supporting walls of the structure. The lower part is built "in the dumb". 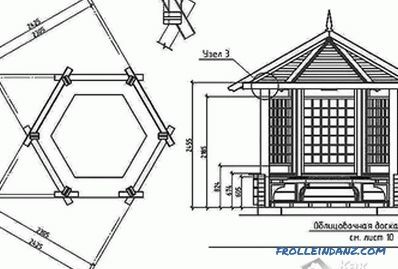 Thus, if the gazebo is open type, the height of the laying from the ground level should be within 1-1.5 m. This will protect the leaves, dust and prevent moisture from penetrating inside the structure during a shower. 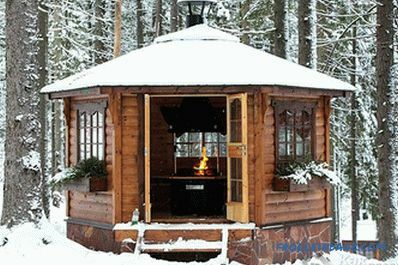 It is better to make the roof in the form of a cone in order to prevent snow accumulation on it in winter. You can make a sloping roof with a slope of at least 10 degrees. The location should not be near the sewage pit to avoid subsidence of the soil and the presence of an unpleasant odor next to it. 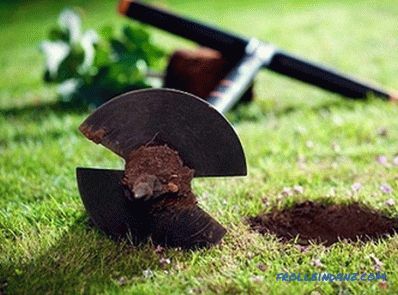 Care must be taken to ensure that there are no trees and plants with a strong root system that would destroy the foundation. You can do without a concrete mixer, but then you will have to do the mixing of the solution manually. First of all Foundation, which can be tape or monolithic. First you need to dig a trench with a depth of at least 0.5 m. A layer of sand 10 cm thick is poured on the bottom of the trench and rammed. A layer of waterproofing is laid on top, as which we will use polyethylene film. Then a prepared framework of reinforcement is laid on a small elevation from the bottom, and concrete is poured from above. 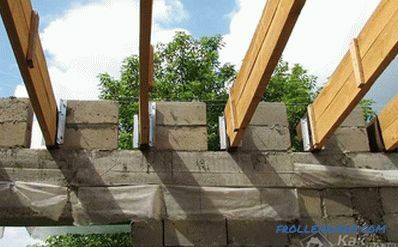 In order for the contours of the foundation to be even, it is necessary to pre-form the formwork well beforehand. During the construction of open arbors, both a strip and columnar foundation are possible. The second is made of brick or butobeton. When filling the foundation, you need to take into account the number of corners of the hexagon. 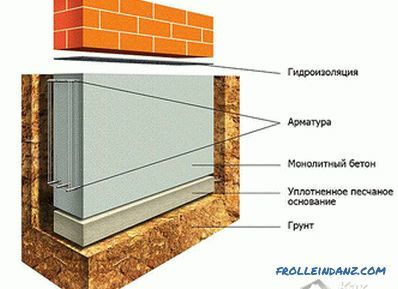 For the open version with only the lower part lined with brick, metal pipes should be installed in the corners of the pit to support the roof of the building. Pipes need to be inserted before pouring concrete and construction level to check the verticality of their installation. Further work is not carried out until the concrete hardens well (this may take 3-4 days). 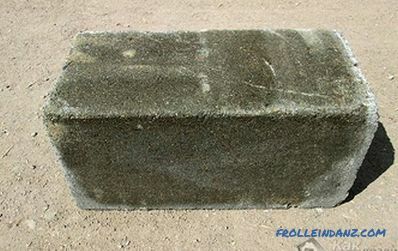 The next step after the foundation will be laying bricks. It is carried out from both ordinary and facing bricks (in the first case, the appearance will suffer). 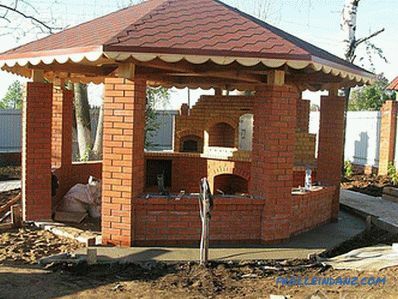 If you use bricks of different colors, you can give a gazebo a decorative and sophisticated look. 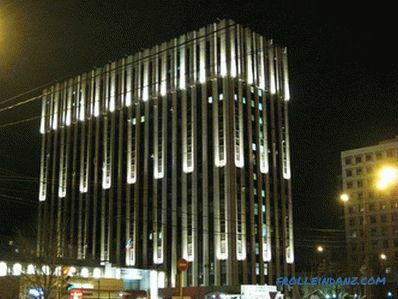 To make the building complete, you can use figured lattices as well as decorative architectural elements as a decor. If wood products are used, they must be soaked in an antiseptic in order to avoid rotting and mold. Also products can be varnished. 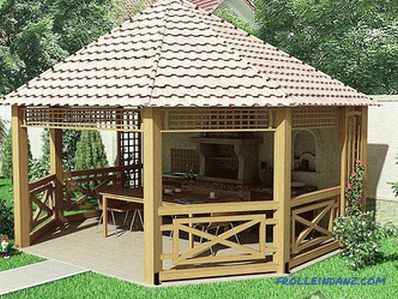 As you can see, if you try hard, you can achieve the desired result, and then the gazebo will be a matter of pride, and using it will bring a lot of joy and pleasure.